One of the early pictures of Church Plain taken some time in the late 1800's. As can be seen there was actually grass growing in places with a track heading left of the church down to the main road. Hewitt's Butchers is the middle building and the cottages right of it were demolished to make way for a driveway to Church Farm. 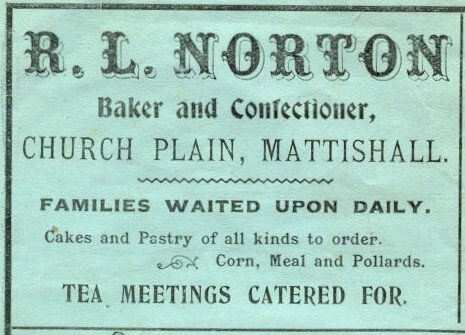 The other side of the plain was Norton's Bakery - unfortunately this is only a photo copy of the original but it still gives quite a lot of detail. Notice the loft door over the main door so it appears the first floor was used as a store room. An old advert placed by Richard Norton taken from a village leaflet. The loaves of bread are all loaded up and ready to be delivered to homes in the village as well as the surrounding area. Sadly this is a photocopy of the original but it shows Mr & Mrs Norton outside their shop. Here we can see Neave's Stores the ground appears to slope up to the shop door which means there must have been quite a bit taken off the plain as now there is quite a step into the store. Not sure if the plain is covered with dead leaves at the bottom of the picture or if it is a grass area. 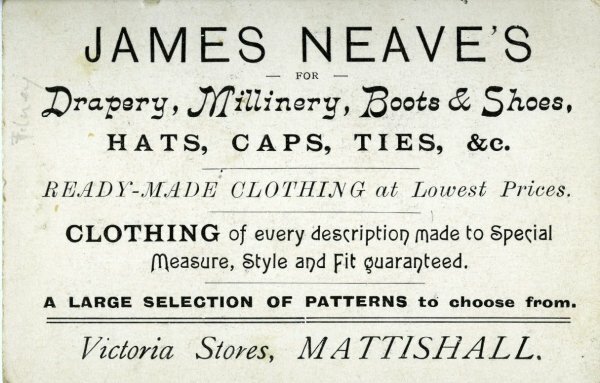 James Neave was born in 1862 at Wymondham. James married Anna Eliza Bayes in 1881. James had served his apprenticeship at Mr William Churchyards shop at West Street Cromer. After their marriage they must have spent some time in Norwich as two of their children, Albert and Kate were born there but by 1891 James and Eliza had their own shop in Well Green Street East Tuddenham where their daughter Bessie was born. 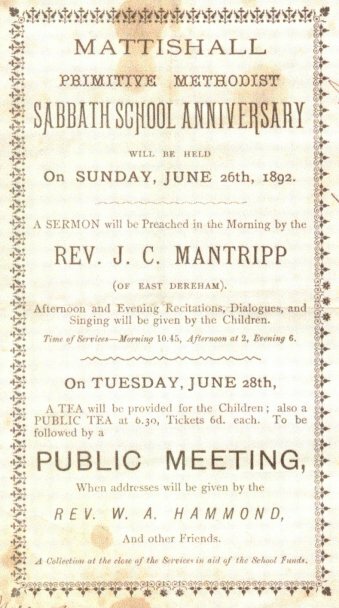 They were still living at East Tuddenham in 1901 but by 1911 had moved to Victoria House Church Plain Mattishall where James is recorded as a Grocer-Draper and Farmer. James died in 1929 age 66, he was buried on February 9th at Mattishall Cemetery. Anna Eliza died in 1949 age 86 at Norwich Outer. This is a picture of Albert Anthony Neave born in 1885 the son of James Neave (1862) and Eliza Bayes (1862). Albert took over Victoria Stores from his father. Albert married Olive E W Botwright in 1911 at Great Yarmouth. Olive was the daughter of Herbert John Botwright a butcher of 35 Middlegate Street Great Yarmouth. Albert and Olive had two children, Harvey James Herbert born 1916 and Jeffery W 1920. Harvey died in 1921 age just 5. Jeffery moved to Yarmouth where he married Kathleen S Ladbrooke in 1946. Olive died in 1951 and Albert died some seven years later in 1958. The picture shows a gravel surface meaning it was taken before 1930 when the plain was surfaced. This is Nellie Aileen Pearce who was born in the September quarter of 1899, daughter of Frederick William Pearce (1865) Blacksmith and Farmer of Mattishall and his wife Kate Gapp. The bike is probably a photographers prop as it looks a little big for Nellie. There is another picture on 'Dereham Road -Welgate Corner ' of Louisa Turner where she appears to have the same bike. This picture was taken outside Neaves Stores. Nellie married Robert Philip Pearce born in 1897 (no relation) in the June quarter of 1923. Nellie and Robert had one daughter called Mollie born June 23rd 1923 who was the owner of this picture. Robert died in 1964 age 67. Nellie died in 1977 age 78. Mollie never married but was a very active lady as a Girl-Guide leader in her spare time after working in the doctors surgery during the day. Mollie died in 2006 age 83. Another view taken on Church Plain this time facing the old cottages that were demolished and All Saints Church entrance. Between them is the little road leading down to the main road that passes Talbot House and Church Cottage. Talbot House was once Mattishall's Post Office (picture below) before it was moved to the corner of Burgh Lane. Talbot House - What is believed to be Helen Harmer standing left at the door of Talbot House Church Square. The picture is thought to have been taken about 1884 when Talbot House was the village Post Office. The postmen standing next to her could be he husband William Harmer and one of the ladies in the light dressers could be Addie Hewitt daughter of Daniel Hewitt a Butcher of Church Square. William Harmer had been a Shoemaker in Mattishall for several years living in the houses near All Saint Church. In 1868 his wife Jane died at the age of 55. In 1874 William re-married the widow Helen Grimmer nee Seaman a Grocer and Draper of Lyng Norfolk. Helen had been living near the church at Lyng with her nephew George Henry Seaman. Sometime after their marriage William and Helen took on the position of Mattishall's Postmasters at Talbot House. In 1886 William died and form all accounts Helen carried on as Postmistress. We assume Helen's Nephew George Seaman had come to Mattishall with her for in 1889 he married Juliet Ada Hewitt. Juliet was the daughter of Daniel Hewitt the Butcher of Church Square. From census records we find Helen was still Postmistress in 1891 with a live-in assistant Addie Hewitt, the younger sister of Juliet. Helen died in the June quarter of 1891 and her nephew took over the position of Postmaster together with his wife Juliet as Postmistress. A position they held for many years. Addie Maude Hewitt married Richard Leslie Norton a Baker on Church Plain in 1904 and their cousin Edith Marion Hewitt married Frederick Cole. Edith and Frederick would take over as Postmaster after Juliet and George gave up the position and the post office moved to the corner of Norwich Road and Burgh Lane as seen in 'Norwich Road'. Matthew Parker was born in Norwich on August 6th 1504. Apparently he came from a well-to-do family however little is known of his origins and early life. He was educated at St. Mary's Hostel and at Corpus Christi College, Cambridge, in 1521 he took his B.A. degree in about 1524-5. He was ordained in 1527 and that year elected Fellow of the College, having refused an offer to migrate to Wolsey's new foundation of Cardinal College, Oxford. 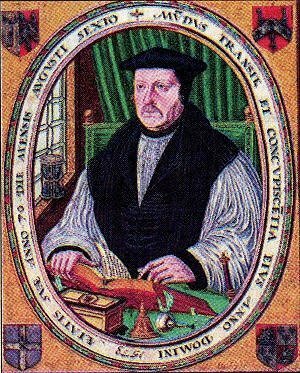 Matthew Parker was Chaplain to Anne Boleyn and later to Henry V111. Matthew Parker married Margaret Harlestone on June 24th 1547. Margaret was the daughter of Robert Harlestone of Mattishall (1490). They had been betrothed for seven years, but as long as the law forbade the marriage of clergy Parker was doomed to celibacy. However in anticipation that the law would be amended by the Lower House of Convocarían, Matthew married. It was claimed he lived near the church for a while and was a spy for Queen Elizabeth 1 and so it was from him that we get the expression "nosey parker"! Matthew Parker was enthroned as Archbishop of Canterbury in 1558, during the reign of Elizabeth 1. Margaret became mistress of Lambeth Palace for eleven years until her death in 1570. Margaret never forgot Mattishall and in her will she left to the Parish land to the value of fifty shillings per annum. She also directed that a fellow of Corpus Christi College, Cambridge (of which Parker had been Master) should preach each year in Norwich, Thetford and Mattishall at Rogationtide. The Parker Sermon continues to this day. During Rogation Week the ceremony of beating of the Bounds' took place, and this together with the arrival of an eminent preacher caused much celebration and a Fair began with the traditional hiring of workers taking place. The Fair became known as 'The Gant. Rogation Week is also known as 'Gang Week’ and it is believed that Gant is a corruption of the word 'Gang'. Gants were held regularly in the village until the 1950s when they died out. In recent years a weekend Gant was held in 1977 to mark the Queen’s Silver Jubilee. In 1997 a Gant week was held with a 'Millennium. In this picture Mr Dennis Enk and his wife Beryl nee Durrant now own Victoria Store the cottages have gone, so has the big tree on the corner of All Saints Churchyard and the road has been surfaced. Behind Victoria Stores is a building that was used as a Primitive Methodist Meeting House - Apparently when it was first used there was a lot of friction between the Methodist and the Church of England and they would try to disrupt each others services. The Methodist moved out in 1900 when their new church had been completed on Dereham Road. The building is now a Cafe called Tabnabs owned by Gill Currie nee Enk.